MAKE IT A CAPITAL IMPROVEMENT! WHEN YOU HIRE US, WE'LL BE THERE! 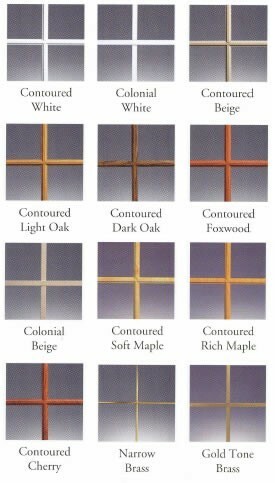 Classic Grids are available in Colonial, Diamond, Craftsman, Prairie and Double Prairie patterns. 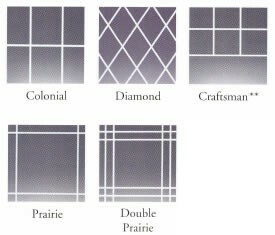 Contoured Grids are available in Colonial, Prairie and Double Prairie patterns. Gold Tone Brass Grids are available in Prairie and Double Prairie patterns. 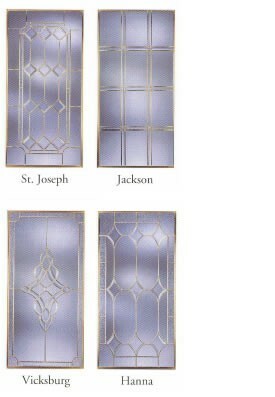 Narrow Brass Grids are available in a Colonial pattern. 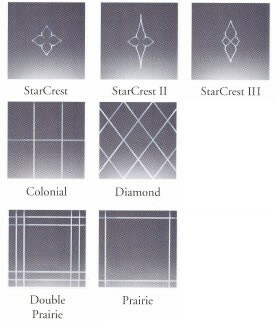 Add a cut or polished V-grooved glass pattern to your window for the perfect touch of elegance. These options add personality and curb appeal to any home. All leaded glass is crafted using hand-cut glass, crystal bevel clusters, and hand-soldered camings. Available in four attractive glass styles to suit your architectural décor. Select a caming metal to match your taste – brass, pewter, or lead.